Artists frequently have writers-block when writing about their work. I came to a realization quite recently that one of the reasons that we artists don’t want to clarify completely (if that were even possible) is that we do not want to limit the meaning of our work. Even titling a work locks in a particular meaning. To an extent, my work is about autonomy. Writing about a particular piece, or my work in general, seems to me to lessen the autonomy of my work. That’s my silent “Gary Cooper” side. My blabbering side knows that truly great art can survive having endless tomes written about it. Wagner’s Ring demands analysis, yet every analysis of it ends up being a bit like a hamster on its endless wheel. The absolute meaning is elusive because some new conception of what the work might mean opens up even more meanings. It can’t be analyzed completely because it is an autonomous thing. It deftly leans away from the high-and-inside-fastball of analysis, because it exists to be experienced, not analyzed. 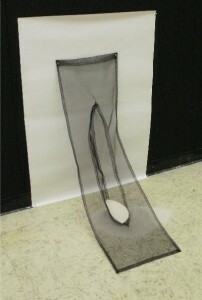 This sculpture is made out of fiberglass mesh (window screen), with sand poured through it. It is hard to get a sense of this piece from this photograph, but it’s better than nothing! There is a kind of archetypal vessel form indented into the surface of the mesh, as if one were seeing the hole that a hull (try saying that) leaves in the water. In a strange way, the vessel is not present. No, I’m not sure exactly what this means! I believe that a sculpture is a fulcrum of reality. It stands at the center—a pivot—between matter and mind, since it is the progeny of both. It is material informed by intent. I feel that a sculpture is most powerful when it straddles the threshold between the concrete and the conceptual. Therefore, I will explore the means by which a sculpture can best inhabit the world between these poles of reality, exploiting both the sensuality of the sculpture as an object, and its transcendent, metaphysical aspects. The palpable physicality of a sculpture—its concreteness—grounds it in the actual world. Yet, a sculpture is tied to the metaphysical, since it emanates and absorbs associations in its relations with the world in ways that go beyond its physical presence. I use fragments of mythic narratives as a means of exploring and linking my sculpture to the metaphysical concepts that I feel are necessary for meaning beyond the pure physicality of the object. I use myth as a trove of evocative symbols that can be refashioned for my own purposes, and for the way myth links us to the unknowable. Even though it is not my only source, I find Norse myth to be particularly fascinating because of its odd combination of adventurousness and fatalism. I try to tap into the power of the narratives embodied in myth, and the cosmogonies (creation stories or theories) inherent in them. I want my work to take part in the innate creativity of these stories. I do not want to merely illustrate myth, or to retell it, but to take part in its processes of growth and transformation. From the Norseman’s hand came his ship, and from his mind his myth. This division of hand and mind implies a division between making and thinking. However, a handmade object is inextricably fused to the processes of the mind. This fusion is one of the reasons I will be going to Oslo for six weeks this summer to explore extant Viking ships and learn the Norwegian language. The study of form and language is inseparable from my investigation of matter and mind. I will witness the physical reality of the ships, and simultaneously delve into the processes by which mythic narratives are developed within the context of language. This research is also a means of exploring how the apparent seamlessness of narrative—the way a story creates its own reality—might be transferred to sculpture. My investigations in Oslo will provide me with source material, both visual and conceptual, that will inform my subsequent thesis work later this summer and fall. I like to work simultaneously from the plainly concrete, uncomplicated form, and the most abstract, intellectual idea. I have focused on the vessel-form because of its simplicity and the ease with which the viewer can recognize it at different scales and in different sculptural manifestations. The vessel—a ship—is readable, yet I also find that it serves to link the concrete, actual world with the abstract realm of ideas because of the way it invites symbolic interpretations. As a sculptural form, the vessel enables voyages: between the concrete and the abstract, and the correlative voyage between nature and culture. The archetypal ship-form in my sculpture can seem organic like a husk or leaf, or it can look hand-crafted like a ship. It can also resemble a human form, representing a character in a drama. No matter what role it plays, a vessel is a carrier of ideas. It can hold and transport something—a cargo—that is separate but dependent on it. A vessel also carries ideas that are part of its innate structure, ideas that pervade its materials and form. This becomes the record of its creation, of maker and toil, and of the culture in which it was created. Part of the metaphorical power of the vessel (whether ship or sculpture) is that it continues its existence separate from its maker. It goes off and “does its own thing.” It is autonomous. Through the sensuality of materials, I plan to ground my sculptures firmly in the here-and-now. But through the evocation of symbols, the sculptures will enable metaphorical voyages. I intend for the format of my Thesis Exhibition to be a natural outgrowth of the relationship of the individual sculptures to each other, and of each sculpture’s role as a fulcrum of reality, as a bridge between the concrete and the conceptual. I want the group of sculptures at the Davis Gallery to be like actors in a play, each an individual, but creating a greater experience as an ensemble. Blü and I parked at the Deer Creek “Snow Play” area (Monday May 7) on the Mountain Loop Highway (about 65 miles from Seattle), thinking the road was closed all the time to vehicular traffic…but no. Anyhow, it didn’t matter. We walked up the road through the open gate and didn’t see a car the entire 3 hours of so that we were there. There was snow on the ground starting at about 2800 feet. (Beginning elevation is around 1200 feet, I think). It’s nice to walk–or trudge–over the snow in short sleeves in the sun. It was in the mid-sixties and sunny. Very beautiful. Interestingly, it was like stepping back in time because even though spring is in full swing at home near sea level, up at 2800 feet (in the snow!) the buds are swelling, but there are no leaves on the deciduous trees. Most of the trees are evergreens, BTW. I wanted an easy hike because I had hurt my knee. Deer Creek fit the bill just fine. I stopped and did some sketches on the way back down. We didn’t make it to the end of the trail because the snow got deeper as we climbed higher making it slow going. I think we hiked (walked?) about seven miles total. 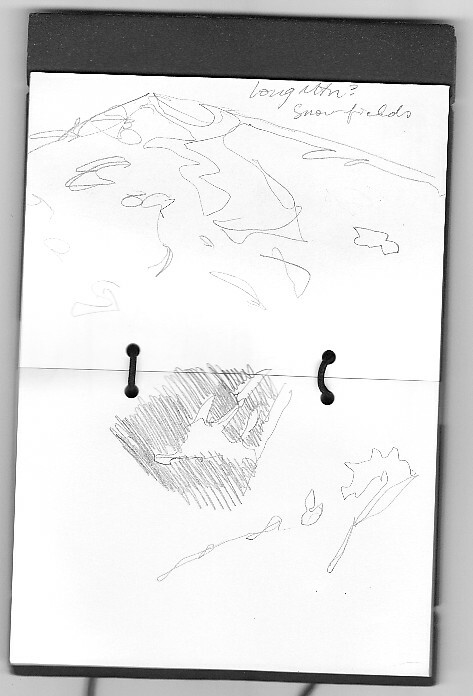 The sketch is of Long Mountain (I think). It was “painted” with snow fields here and there. I’ve always loved the abstract pattern of snow fields and avalanche chutes on mountains. This is a scan from my sketchbook. The drawing of Long Mountain is right side up in this view. The sketches lower down in the image are on their sides because I was holding the book the “normal” way when I did them. They are “close-ups” of snow fields.